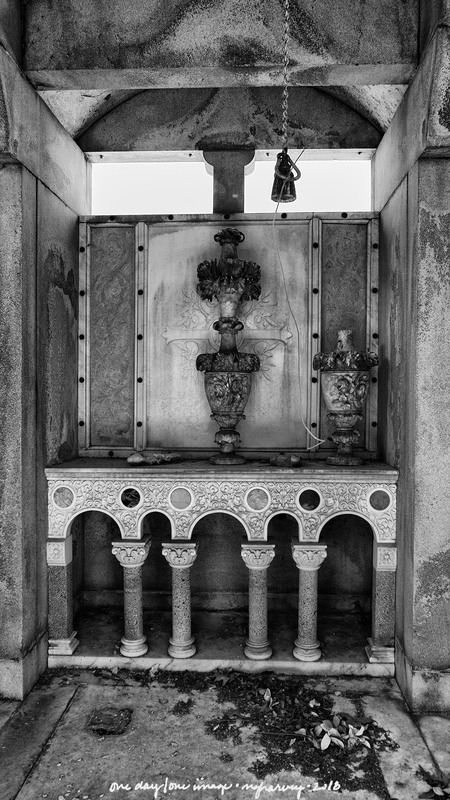 Many of the tombs here at the Metairie Cemetery are inaccessible – there are heavy, locked gates across them. Fortunately, though, my camera fit between the bars of the gates and I was able to capture this graceful interior. Posted on May 13, 2018, in Photography and tagged 365 photo project, black and white photography, cemetery, learning to see, Leica, melinda green harvey, metairie cemetery, monochrome, one day one image, photo a day, photography, postaday, thoughtful seeing, travel photography. Bookmark the permalink. 4 Comments. Another great find. Seems as though the horses got revenge on both groups. It was very entertaining to find out the connection (on both ends of the story) to horses. When I was in grad school in New Orleans, studying urban planning, we did some reading on cemetery history, and their use as parks in an era when there wasn’t green space in cities (that seems like nearly the only thing I still remember from school). Anyway, as part of that, we learned about Metairie Cemetery’s prior use as a racetrack. It took a blog + Wikipedia for me to learn about the fate of that poor gentleman. Oh dear sounds much like a merry-go-round. Such an interesting history. And you are so right, the interior is incredibly graceful .. There were many others that were just as nice – on my next visit to New Orleans, I need to set aside an entire day at this cemetery.